What Makes the Best Spam Filtering Service? In our minds, several factors contribute to making a spam filtering service the best. Naturally, a high spam detection rate comes at the top of the list, followed by ease of use – without which finding an acceptable spam threshold can be difficult. Then there are factors such as outbound scanning and greylisting to consider, and finally cost. However, no two businesses are identical, and therefore each may have different motives for implementing an email filtering service. Some will undoubtedly have had a negative experience that has prompted them to investigate spam filter service providers, while others may be taking a safety first approach and implementing an anti spam filter as a precaution. In our experience, businesses have a wide range of priorities when for looking at a spam filtering service. Therefore, we offer businesses a free trial of SpamTitan in order that they can evaluate the effectiveness of our anti spam filter in their own environment. Details of our free trial follow at the end of this article, but first a deeper explanation of what – in our opinion – makes the best spam filtering service. According to research conducted by the Radicati Group, the average office-based employee receives 90 emails per day (2016). Of these 90 emails, 14 emails are spam emails that have been delivered undetected by email filters. The research did not reveal how many spam emails were detected and blocked, but at a detection rate of 99.9% (which most advanced spam filter services are capable of) that would imply an average of 1,400 spam emails are sent to every office-based employee every day. SpamTitan´s email spam filter service has a verifiable spam detection rate of 99.97%. A spam detection rate this high reduces the average number of spam emails received each day from 14 to 4 – reducing the chances of employees falling for a phishing scam or exposing the network to malware by 72%. Employees would also spend 72% less time identifying and deleting spam emails, enhancing their productivity. Of course, detection rates are variable depending on the settings applied, which brings us onto our second consideration – ease of use. In order to best manage threats from phishing, email-borne malware and ransomware, an anti spam filter has multiple mechanisms to determine the risk level of each inbound email. These mechanisms include acceptable spam thresholds (mentioned earlier), Sender Policy Frameworks, whitelists and blacklists, and recipient verification tools. Each of these mechanisms can be applied by individual user, user group or business-wide. (You may, for example, with to apply more lenient settings for your Sales Department´s emails to prevent potential leads being wrongly identified as spam). Whatever user policies you choose to apply, they should be easy to implement. Setting the acceptable spam thresholds too leniently can result in more spam being delivered to employees´ inboxes – setting the thresholds too high can result in business-critical emails being quarantined until manually forwarded by an administrator. Fortunately, with SpamTitan, you will find our anti spam filter works very well with LDAP and Active Directory to accelerate the simple application of user policies. In the past, several businesses have evaluated their email filtering service based on its inbound email scanning abilities, but there are good reasons why a business should also scan its outbound emails for spam and malware. Cybercriminals are now capable of compromising business email accounts and using them to send bulk spam emails from a “trusted source”. In these cases, cybercriminals could be using your business email account to send malware to your clients. An email filtering service with outbound scanning will identify any attempts to use your business account to send spam email, and block employees sending emails that have inadvertently been infected with malware. This precaution can prevent your business email and your business website being incorrectly identified as spam and blacklisted by spam detection agencies. If your emails are blocked, and access to your website is denied, it could result in a substantial loss of business – and credibility. The “Greylisting” process is a controversial one. It effectively returns every email to its sender – or to be precise, its sender´s mail server – asking for it to be resent. The reason an email filtering service does this is to identify non-genuine email sent from spammers´ IP addresses not yet recorded on Real Time Blacklists and SURBL filtering mechanisms – spammers´ mail servers being too busy to respond to the “resend” requests because they are sending out spam emails in bulk. Greylisting is a great way of catching new sources of spam emails and contributes to SpamTitan´s high spam detection rate. However, is a controversial process because it can delay the delivery of business-critical emails. Consequently not all email filtering services include this feature among its security mechanisms. The way to overcome this issue is by whitelisting the senders of business-critical emails – a process that is simple to do via SpamTitan´s administrative portal with the click of a mouse. There is no comparison between the cost of an email spam filter service and how much it can save businesses annually, but the cost of just identifying and deleting spam email is estimated to be billions of dollars each year – and that is before the cost of recovering data on a network that has been infected by malware or encrypted by ransomware. However, there are a series of factors businesses can take into account to ensure they are getting the best deal. 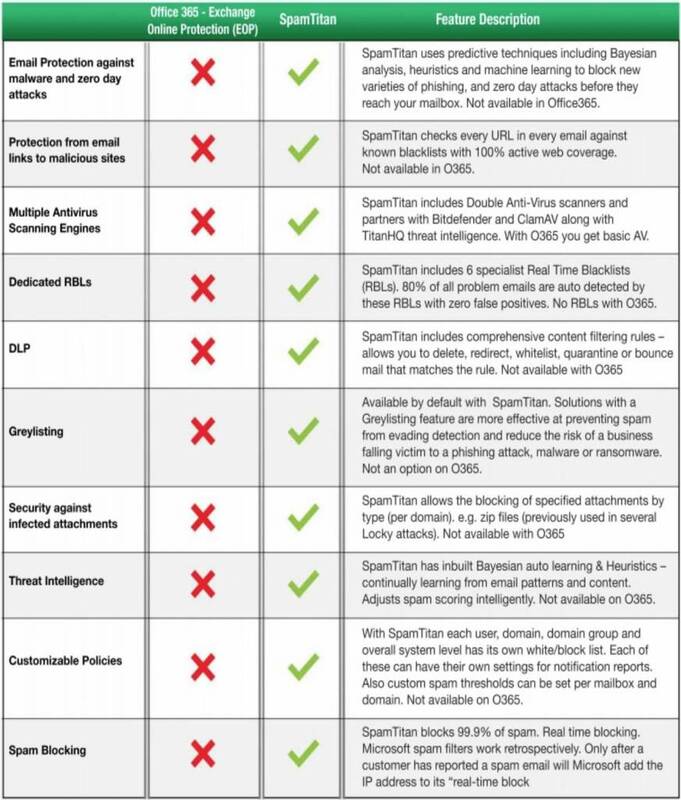 Here at SpamTitan, we price our subscription email spam filter service according to the business´s choice of deployment (we offer “Gateway” and “Cloud” deployment with further “Cluster Node” and “Private Cloud” options), the number of mailboxes the business wants to protect, and the payment schedule. Typically, the cost of SpamTitan´s email spam filter service is around $10.00 per user per year depending on what options you choose, and you are more than welcome to contact us for a no-obligation quote before taking advantage of our free trial offer if you wish. SpamTitan incorporates advanced predictive techniques to detect new ransomware and malware variants, phishing and spear phishing attempts, and zero-day attacks. Each incoming message is subjected to a series of checks to identify spam emails and malicious messages. Before an email is delivered it must pass each of these checks. Many organizations use Office 365 for their email. Microsoft has incorporated security features into Office 365 to detect and block unsolicited messages and malware; however, a common criticism from users of Office 365 is that those checks fail to detect many spam and phishing messages. SpamTitan uses many different mechanisms to detect spam and malicious emails, including SURBL filtering, Bayesian analysis, machine learning, greylisting, dual anti-virus software engines, and malicious URL detection mechanisms. 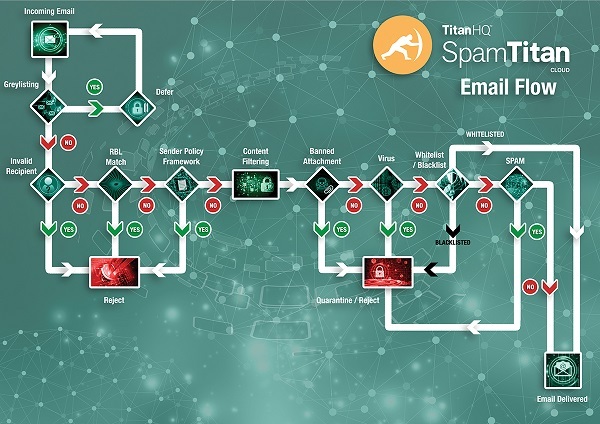 When SpamTitan is used with Office 365, users are much better protected from email threats, including sophisticated phishing attacks and new malware variants. There is no one-size-fits-all spam filtering services, but we have tried to make the SpamTitan spam filtering service as flexible as possible to meet most business´s needs without overcomplicating the filtering or administration process. It you would like to try our anti spam filter for free – and you know which of the deployment would be the best spam filter for your business – do not hesitate to click the “Start Free Trial” button at the top of the page to begin your free trial today. Alternatively, do not hesitate to contact us to discuss your current online security arrangements and seek advice about which of our deployment options would be best for your specific circumstances. Our team of Sales Technicians will be happy to answer any questions you have, guide you through the options available to you, and help you get started with your free trial of SpamTitan´s spam filtering service. The whole process can be managed in less than twenty minutes, so contact us today to find out more. Enhance productivity and reduce emails threats by 72% or more. Easily apply filtering policies by user, user-group or business-wide. Protect IP reputations and business credibility with outbound scanning. Capture spam from previously unknown spamming sources with greylisting. Choose from a choice of deployment options and take a free trial of SpamTitan.